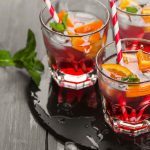 This Damson Gin Recipe originates from the ‘Drinking with Dickens’ book, written by Cedric Dickens (great great grandson of Charles!, which includes all the recipes of drinks mentioned in all of Dickens books. My grandfather was Cedric Dickens drinking partner in WWII, and the book was passed down to me. 1 bottle of gin (750ml is you like it syrupy, 1 litre if you like less syrupy- both work ok). Add sugar and shake every day until the sugar is very pink. Add gin, shake and store in a dark place. Turn and swill fruit around once a day until sugar has dissolved then leave and shake occasionally. After 3 months, strain and bottle. Damsons usually ready in September which means gin is ready for bottling just before Christmas. Works well with Vodka or Bacardi also. Same recipe works well with sloeberries. Rather than pricking the damsons, freeze them and when you take them out of the freezer, they split naturally. I made damson and sloe gin years ago. I now live in The Netherlands, so I’m going to use Dutch jenever instead of British gin. It should come out great, as jenever is drier and less perfumed. It should let the fruit flavours really develop. I’ll keep you all posted. @Gill Lacey: They are the perfect size. I made a litre of Damson Gin this afternoon. I used a litre of Dutch jonge jenever, (Dutch young gin) as I live in The Netherlands and it is cheaper than British gin. It all fitted nicely in a 2 litre mason jar. I split my damsons open after using them for damson gin and dried them in a slow oven. I then used them in fruit cakes or nibbled on them. Hi Gill just made sloe gin today and the 2 lt jars held 1lb of sloes and 1lt of gin with 150 grms of castor sugar no problem, enough space at top of jar for shaking it all up. JUST BOTTLED 2lb OF DAMSONS TO 2lb OF SUGAR AND AFTER 4 DAYS THE RESULT IS NOW BLOOD RED IT LOOKS FAB AND TASTES EVEN BETTER, I THOUGHT IT MIGHT BE TO LATE TO ADD THE GROG OR WILL IT BE OK. I HAVE DONE 2 BATCHES OF THE SAME AMOUNTS ONE FOR WHITE RUM AND ONE FOR GIN. REGARDS GRIFF. 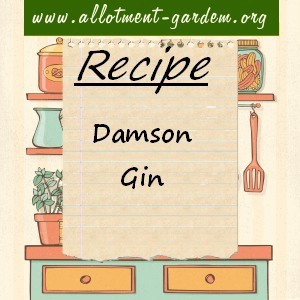 I have a damson tree in my garden so I am having a bash at this recipe. I used kilner jars and popped the fruit & sugar in 10 days ago, before going on leave. I came home this morning to find a lovely gooey liquid on top of the sugar which I have now stirred up and will work for a day or so before adding the Gin. Hi Vernon, just made my second demi john of damson gin/rum. Was surprised to find that some recipes have different amounts of sugar. If it makes it too sweet I will just have to put more alcohol in it. 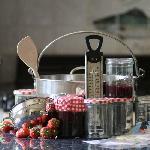 I used the damsons after straining to make Delia’s Spiced Damson Chutney – it really had an extra kick. You can also make a really wicked Damson Crumble. Have just bottled my damson gin and would like to know if and how I can use the gin soaked fruit in any way? Is it really too late to make some for Christmas? What would it be like after only a month? Any views welcome and thanks. Do I need to sterilise new, shop bought bottles before I decant my damson/sloe gin into them? If so, do I need to let them cool down before I do this? Update on the batch I made in September using Dutch Gin, (jenver). It is fantastic! Proost, prettige kerstdagen en een gelukkig nieuwjaar. @Leone Evrenos: Hi Leone, where did you get your sloeberries, I have never seen them over here. @Sharon: Hi Sharon, have you tried bin inn for your demi johns. Use the Damsons to make a fruit pie our family love this. Try it with vermouth instead of gin, you will not regret it. (Use less sugar) I don’t know quantities as I tend to wing it. Don’t forget you can cover the damsons in melted chocolate after they’ve been used in the gin. Just cool in fridge to solidify. Bit messy but delightful result. Good Christmas gifts! How long can the damsons be left in the kilner jars with the gin? We have put damsons in with the sugar today. We will be around to see the sugar go very pink and to add gin. We will also be able to swill gin around for a few weeks until the sugar dissolves but then we are away until March….will this affect anything?